Woolly socks. Sleeping dog. The tea kettle, spitting, hot on the stove. Seed catalogs stacking up. Jeremy scheming crop rotations. A productive, yet wonderfully restful winter. It has become a tradition, in the beginning of the year, to reflect back on the previous year through photos from our quarterly monitoring exploits. Here we are, panoramdemonium 2014. If you’d like to start from the beginning, check out 2012 and 2013. Like traditions tend to do, ours has morphed, it’s evolving – a smidge. We embrace tradition and revolution equally around here, after all. Here is the view of the orchard and hop yard from the beehives over the course of the year. And here is the view of our main vegetable field from the north gate. Since starting, we’ve added a number of points to help better track changes on the farm. We now have just about 25 spots that we take photos from four times a year. One of the photo points we’ve added, for instance, is a shot in the greenhouse. Also, since establishing points, we’ve made the somewhat frustrating / disappointing / unfortunate / we-should-have-known-better discovery that due to the dates we selected (solstices and equinoxes), we are missing much of what we are trying to monitor – peak growth during the summer. June is early yet and by September, frost has already hit. We initially chose the solstice and equinox for monitoring dates because they were evenly spaced dates and easy to remember. Additionally, there seemed to be a certain poetry or romance with monitoring the passage of time on the farm according to the celestial seasons. Now, three years into this, we’ve concluded the monitoring dates are cute, sure, but not entirely effective and will need revisiting. Perhaps photos from CSA week no.x? or Labor Day weekend? August 14th? We’ll figure something out and report back. Tradition, revised. Winter gives us an opportunity to spend time working on plans for the next season, reflect on things that have worked well and things that haven’t worked and need tweaking. Having this bank of photos from the past years has provided fodder for ruminations and stimulated some good conversation. Namely, when will we have time to get the back wall of the greenhouse cobbed? why is there always stuff (piles of wood chips, straw bales, folding tables, upside-down lawn chairs) in our front yard? 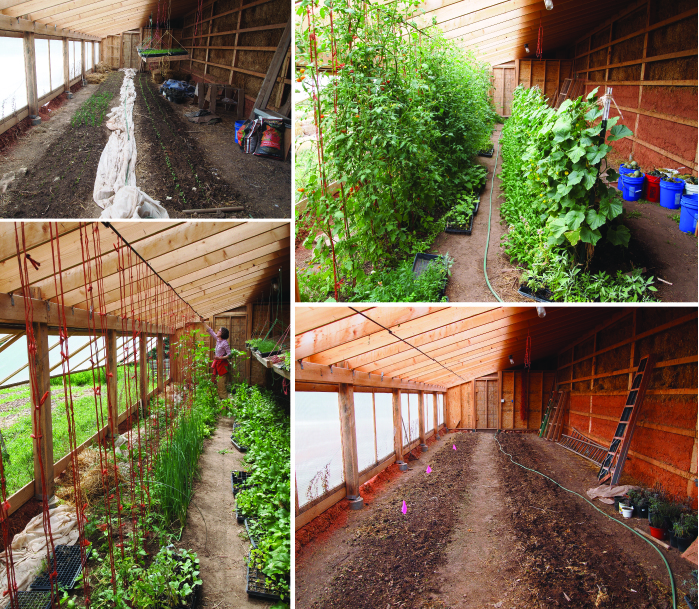 how do we better manage our planting calendar to maximize yield from the greenhouse beds? and why doesn’t everyone plant fruit trees in their backyard? We’re putting together more thoughts about the year overall and are looking forward to sharing that here soon. This entry was posted in farm update and tagged beginner's mistake, photo monitoring by Cycle Farm. Bookmark the permalink. WOW! I see tons of progress! I know a person who is great playing in mud who is moving your way–don’t give up on the cobbing!